Over the past year or so, I’ve been reading quite a few thrillers. They’re (almost) always quick, exciting reads. And they’re really just fun. I’ve been in the mood for a new thriller, and was looking for one that would blow my mind. Samantha Downing’s debut novel, My Lovely Wife, fit the bill. (From Goodreads) Our love story is simple. I met a gorgeous woman. We fell in love. We had kids. We moved to the suburbs. We told each other our biggest dreams, and our darkest secrets. And then we got bored. I was hooked the second I read the synopsis for My Lovely Wife. It’s so dark, and intriguing. And I am very happy to report the book did not disappoint. At all. I finished all 350+ pages of this in less than 24 hours. On a work day. Because it was nearly impossible to put down. Hey, I may have spent six hours sneakily reading on my phone at my desk, but I still finished all my work. Just saying. Also, I have no regrets. I am still kind of in awe that this is a debut novel, because it did not feel like one at all. The writing was seriously impressive. And you all know how picky this MA grad is about writing. It was really good – it pulled me into the story without being the least bit intrusive. I rarely say this, but My Lovely Wife was a pleasure to read. I’m really looking forward to Samantha Downing’s next thriller, but I’d honestly read anything she writes because she just does it so well. One thing I’m always a bit nervous about going into thrillers are the twists. Because for someone who doesn’t read a ton of thrillers (it’s not even in my top five most read genres), I am very good at predicting twists. Not to brag, or anything. So it’s a great book that can shock me. And this one did it. I might have gasped aloud at one point (at my desk while I was supposed to be working). I did see a few of them coming, but the big ones definitely caught me off guard, in the best way. Unlike so many thrillers in the past few years, My Lovely Wife was not marketed as “the next Gone Girl“. But, guys, I think this is finally it. It was similar while still being original, which I loved. I read Gone Girl four years before My Lovely Wife (almost to the day exactly, according to Goodreads), and I haven’t felt this way about a thriller since then. It’s seriously good. 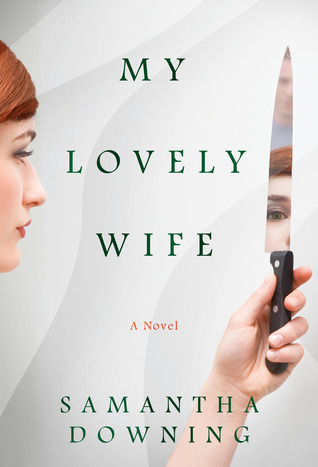 ★★★★☆ – My Lovely Wife is more like a 4.5-star book. It was close to perfect, I just wish I’d gotten a bit more background into the characters. Without spoiling anything, I wanted more context as to why things played out the way they did. But, honestly, best thriller I’ve read in a really long time. If you like thrillers, or you enjoyed Gone Girl, this is a must read. My Lovely Wife will be available in bookstores March 26. You can order a copy on Amazon now. To get the audiobook for free, use this link to sign up for a free trial of Audible and choose My Lovely Wife as one of your two free books.